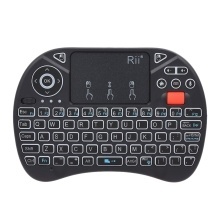 Rii i8X Plus is an advanced 2.4GHz wireless mini QWERTY keyboard and TouchPad combo which support voice input, with USB interface receiver. Plug and play, simple and smooth. The mini keyboard ensures convenient typing, and you can control your devices on your couch. Advanced Voice Input & 2.4GHz Wireless Connection: Rii i8X Plus support voice input and 2.4GHz wireless connection, up to 10 meters wireless control. With USB receiver, plug and play. Compatible with PC, Notebook, Smart TV, Android TV Box, etc. Backlit Function: With backlit function, you can conveniently use the keyboard in the dark.8 colors of backlight can be freely switched (Fn+Win). High Sensitive Touchpad: Easy to operate left mouse, right mouse and rolling screen. Supports touchpad DPI adjustable functions, better matching different sizes of screen. 71 Keys Keyboard: The mini keyboard ensures convenient typing with 71 keys, and you can control your devices on your couch. Also features auto sleep and auto wake mode. Scroll Wheel Function: The new design can help you scroll through long documents or web pages faster and easier, same as using your mouse. Note: USB Dongle is placed at the back of the keyboard.